From the bowels of Vesuvius, Pulcinella, a foolish servant, is sent to present-day Campania to grant the last wish of Tommaso, guardian of the Royal Palace of Carditello. He must rescue a young buffalo called Sarchiapone. Pulcinella takes the buffalo towards the north. The two servants, man and beast, embark upon a long journey throughout a lost and beautiful Italy. Bella e Perduta is a touching, surreal fairy tale showing our complex relation with nature. 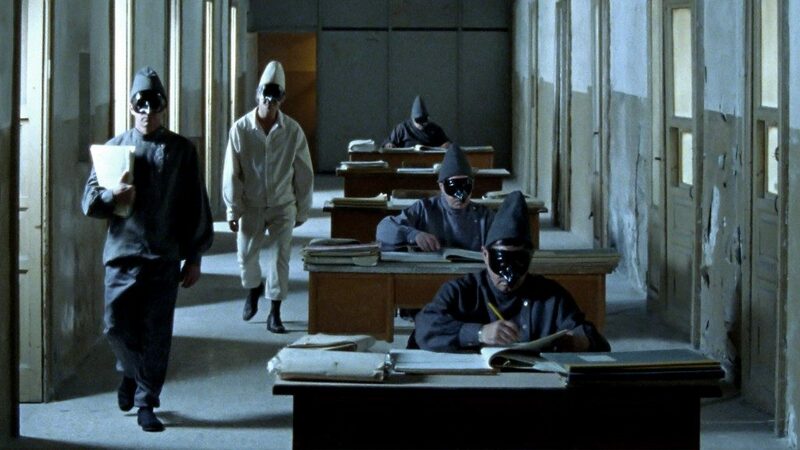 The film premiered at Locarno last summer where it won the Special Mention Ecumenical Prize. The film was screened at IFFR and has been selected for New Directors/New Films. It’s Saturday morning, 11am and I meet director Pietro Marcello, script writer Maurizio Braucci and actor Sergio Vitolo in the Doelen for a chat. The three grew up around Naples, Italy and have been friends since a long time. Pietro and Maurizio have been working together before and Sergio, although not a professional actor, plays the role of Pulcinella. RMA: De landscapes were almost like paintings. PM: I studied to become a painter, but I wasn’t as good in painting as I was in film. RMA: I thought you could have had a technical background, because last night during the Q&A you seemed very certain about working analogue instead of digital. PM: I just prefer to shoot with film, but it’s not a dogma. PM: Yes, that’s true, but I cut in the production costs; there is always a way. RMA: How did you discover the Royal Palace of Carditello? PM: The idea was to make a trip in Italy. I wanted to document the countryside; the place where I grew up. During this trip we met Tommaso, the guardian of the palace and we decided to focus on him. But after two months he died. RMA: Wow, your main character passed away? That’s very unfortunate. PM: Very, it was very sad. We continued our story with only the buffalo who was once again an orphan. Tomasso saved a lot of animals. In our modern industry there is no use for buffalos that do not give milk. In the past they worked on the land, but the industry took over their tasks. And they are to expensive to raise for the meat industry. A cow needs only six months to grow up, but a buffalo needs two or even three years. MB: Tomosso was well known in the area and the symbol of the countryside. He embodies that honest farmer fighting to secure the land from toxic waste. Fighting against the government. RMA: And pro camorra? I could hear people scream camorra. MB: Yes, that’s right. The people are pro mafia because they feel protected by the mafia. They are the local, tribal power. RMA: And after Tomasso died you decided to write a fiction scenario? PM: The idea was to make a fairytale. 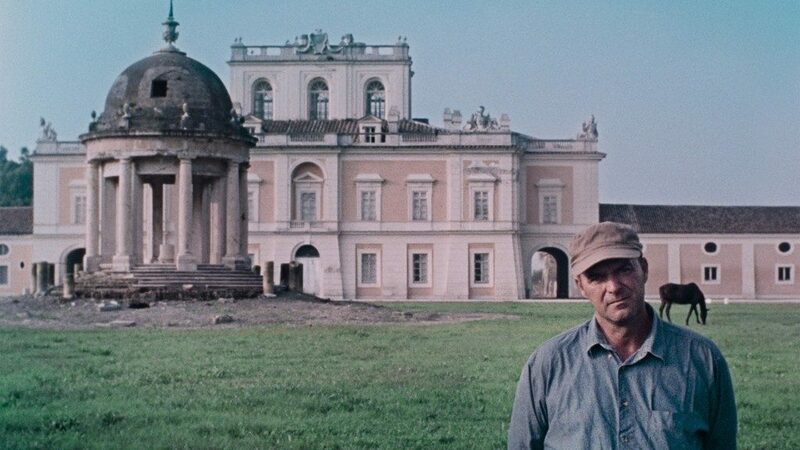 Our starting point was Tomasso, who was living in this abandoned palace and took care of animals. 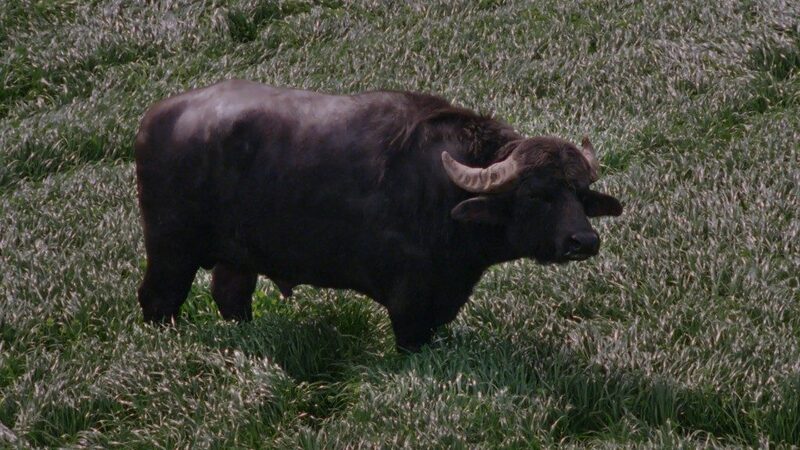 After he passed away, the buffalo became an important character and we also developed the character of Pulcinella, who was to guide the orphan buffalo. It was hard to decide on whether or not to use the figure of Pulcinella. In Italy he is a cliché and abroad people might not be able to understand who he is. Plus our Pulcinella is not a clown, he is a tragic figure. What do you think? Was it clear for you? RMA: Yes, it was. And because your film is not a feature film in the traditional sense I like your choice to use an archetype. MB: The question is: what is an independent film? Independent film is something you don’t want to control from the beginning until the end. Industrial film is script driven. Our film is independent. The process was dialectical; he [Pietro] also produced the film himself. RMA: You produced the film yourself? PM: Yes. The editing was very important. To make the story continues, we had to sit next to the editor. MB: We let the story guide us. While we were filming, we discovered it. That is independent film. PM: It was also because our script was incomplete. There is always a transition. The written scenario can be a great read, but it might not work on film. I always have many doubts on the scripts. It can be complicated to find the right dialogues. RMA: It was your first time to toy with fiction. Are you planning on making another feature film? PM: I’m not interested in making purely fiction. I would like to continue making different cinema. Experiment. Find new ways. Making a traditional feature film to me seems really boring. But I still need to understand what direction I will go. MB: Don’t you think cinema is changing? RMA: Yes, I very much believe cinema is changing. Directors are clearly exploring the boundaries between fiction and reality. PM: Most of all I want to continue to make films about my country. RMA: So, where does your patriotism come from? I wanted to ask you that because yesterday during the Q&A you also mentioned ‘your country’ a few times. PM: [Laughing] No, it’s not like that. I just mean I love the countryside. The land. Maybe because that is where I was born. No, Italian people is another story. RMA: [Laughing] I’m glad we cleared that out. MB: We just love tomato’s, onions; we love our soil. PM: He does! [pointing at Maurizio] He is the vegetarian side. RMA: He is my friend. MB: I love animals. Veganism is the future. Last night we spoke about the fact that’s nowadays conflict is between capitalism and nature. RMA: Do you think that conflict will be solved in 50 years? PM: I think in the future people will leave the urban area. It is in fact a complicated place to live; men will eventually move back to the countryside. The urban area might become a place populated by immigrants. MB: All current conflicts, worldwide, were ultimately caused by our greed for fossil fuels. People are escaping political decease, war and poverty. All is linked to nature and environment. Can you imagine, this place used to be the Roman Imperium, before Rome was build. This is where all agricultural technic was born. It is a volcanic area, a very fertile area. And this land is being destroyed by men. It is absurd, but at the same time it is also human nature to be self-destructive. PM: When Pulcinella removes the mask he is freed, because he has become a real person. And only a real person, who is participating in this society, is able to change that society. But when he loses his mask, he does not have the ability to talk to the buffalo anymore. He loses his innocence. RMA: Last question: where is the buffalo now? Is he still alive? PM: He is very fine. He is a grown-up now and this spring it will be his first time to breed. We look after him; he is our buffalo. And he is famous. People go to visit him.